November 6th We celebrate the first liturgical Memorial of the Spanish Martyrs of the 20th Century. 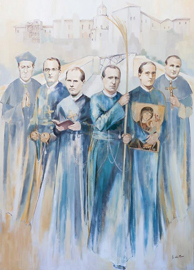 Among these Martyrs are six Redemptorist Missionaries: Fr. José Javier Gorosterratzu, Fr. Ciriaco Olarte, Fr. Miguel Goñi, Fr. Julián Pozo, Br. Victoriano Calvo and Fr. Pedro Romero. Remembering the witness of their lives and their deaths is a special occasion for the whole Congregation.